Goverdhan Nath Ji temple is located in Hawa Mahal complex, Jaipur. Even though it shares the common entrance with Hawa Mahal, this temple has a quite understated presence. To begin with, there are no marking or signboards on the main road- Tripolia Bazaar to proclaim the presence of this temple. On entering the Hawa Mahal complex courtyard, all you see is tourists, bound for Hawa Mahal, but no signages to guide you to the temple. Goverdhan Nathji temple is located at the far end on the right side of the courtyard, facing west direction. Goverdhan Nath Ji temple dates back to the year 1790. The temple is dedicated to Lord Krishna & Radha. Maharaja Sawai Pratap Singh commissioned this temple. The temple was constructed with Hawa Mahal, simultaneously. In a way, this temple is also associated with world famous Hawa Mahal. Since both these structures are interlinked, one of the exits of Hawa Mahal leads out through this temple complex. When I visited this temple, the sanctum was closed for the public. As is the tradition in most of the old & famous temples in Jaipur, there are fixed timings when one can have darshan of the idol. The temple is open for the public 7 times a day, each slot lasting for half an hour. I conversed with the caretaker of the temple, Mr. Pareek. He informed me that the temple is dedicated to Baal Krishna (Lord Krishna in the child form). At present, the temple has been leased out to kama based trust. Otherwise, it is managed by Devesthan Department (under the Rajasthan government). The temple has exquisite paintings on the wall, although lack of maintenance is quite evident. The style of painting is local. The work and engraving on marble pillars are typical to Jaipur style of architecture. 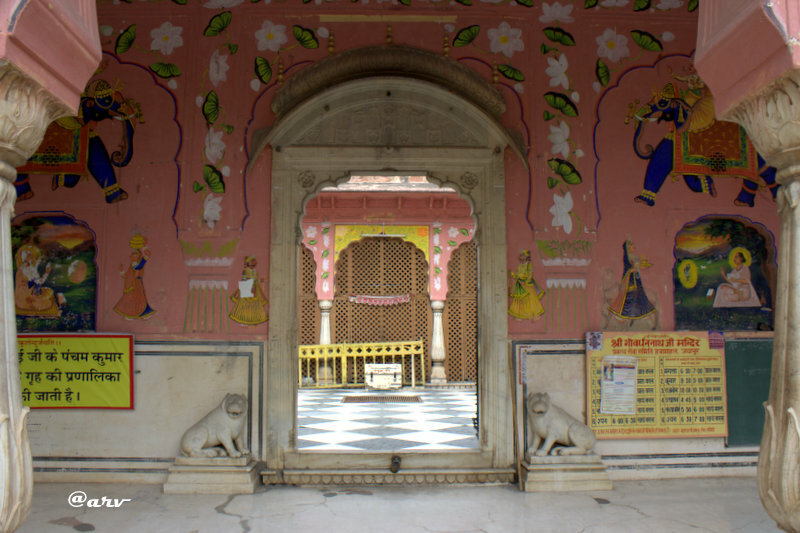 There are two marble tigers (called Naahar in local Rajasthani language) on both sides of the entrance gate to the temple courtyard. Although this temple doesn’t have elaborate & ornate construction style, it does have impressive local design elements. This is evident in the above picture in the workmanship in pillars and faux Jharokhas. Beautiful workmanship destroyed by a shoddy paintwork. Located in the Southwest corner, on the first floor is another small temple. This temple is dedicated to Lord Vallabh & Radha and can best be described as a small room devoid of any architectural feature. The priest, Om ji commented that temple walls were once adorned with beautiful paintings. However, over course of years these paintings were replaced with a paint on the wall. Here is a picture of the idols from this temple. The manager, Mr. Pareek opined that in past, this temple was very popular among the public so much so that finding space in the courtyard at Aarti time was a tough job. But today owing to neglect from the authorities and bad management, things have taken a different turn. Club it up with your visit to the Hawa Mahal. This temple has a direct entrance from Sirehdyodi Bazaar too! Barely few steps from Hawa Mahal! Pingback: Shri Goverdhan Nath ji Temple -understated but impressive ! | jaipur thru my lens !! Pingback: Pratapeshawar Temple… | Jaipur thru my lens !! Hello! I am very happy to discover Jaipur through your lens, eyes and in your vision! I’m happy to know that you liked Jaipur. just for your information, it’s a big centre for jewelry manufacturing & trading , including cosmetic and Commercial ones! I hope to visit Jaipur some day! I was fascinated by the beautiful temples! I love Indian Jewelry very much! Pingback: Hawa Mahal- Face of Jaipur – Jaipur thru my lens !! The paintings in the temple were drawn and painted by Sh Nandkishore Sharma S/O Sh Omkar Prsad ji Sharma. He was an employee of this temple and was handicapped (one leg ). He at his own cost and time drew and painted these paintings during 1970 to 1974. He was posted at the post of Kirtaniya (musician). His intense devotion for Lord Goverdhanji was remarkable. It’s a great piece of information and hard to get by! Is there anything more you can contribute towards this temple in terms of information? Pingback: Brijnidhi Temple, Jaipur – Jaipur Thru My Lens !! Temple is correct, but the picture of the idol posted by you is not of Goverdhan nath ji, it is of Vijay Govind ji ( a temple near the gate of Goverdhan nath Ji Temple). Dear Vismita, I have already mentioned in my blog that there is another temple in the South-west corner. I don’t the name of this temple because it is not mentioned anywhere. Whatever information is written here is provided by the priest himself. Every time, I have visited Govardhan Nath Ji, the sanctum was not open. Coincidence…I suppose! Thanks for the information. Do you keep visiting this temple?